Authorities say the female driver, who is 73 years old, was driving a passenger sedan that was badly damaged in the bus crash. She was seriously injured and trapped in her crushed vehicle. When first responders arrived on the scene, they called for a fire department rescue squad and rescue personnel were eventually able to extract the victim from her car and take her to a local level one trauma center. The bus was said to be transporting players on the girl’s rugby team. 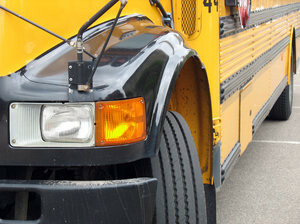 This article brings up how dangerous a truck or bus accident in Boston can be. While every motor vehicle accident can result in serious personal injury or death, accidents involving commercial motor vehicles are often much more serious due to the weight of the vehicles involved. For example, a sedan may weight around 2,000 pounds, while a bus can weight 30,000 pounds. A loaded dump truck can weigh around 80,000 pounds. The weight of a truck or bus not only affects the impact of the vehicle involved in a motor vehicle accident, but it also affects how long it takes a vehicle to stop. For example, we all know how long it takes to stop a car on dry pavement, but a truck on the other hand takes a considerably longer amount of time. It could take an average semi-tractor trailer over three football fields to stop. This is true with a truck carrying bulk cargo. However, a liquid hauler, whether we are talking about milk or gasoline, is even more difficult to stop. A tanker truck truck is full of liquid, that liquid will shift forward when the truck comes to a sudden stop. This has been known to push a truck entirely through an intersection causing considerable damage. There are walls inside the tank known as bulkheads designed to compartmentalize the liquid. There are typically holes known as baffles drilled into the bulkheads to slow down the flow of the liquid to prevent this, however, a milk truck for example, cannot have baffles as they are too hard to clean and this makes it particularly more dangerous. This means that if a defendant is driving a commercial motor vehicle, they are essentially held to a different standard of care than a driver of a passenger car in a car accident lawsuit. In these cases, the truck or bus driver is required to act as a reasonably prudent commercial driver so as to prevent foreseeable damage foreseeable plaintiffs and their property. This is not to say they are held to an expert standard of care like in a medical malpractice case, but they are expected to use their required training to prevent an auto accident.